There are two sides to the argument over how to read Lewis’ iconic collection of books: in release or chronological order. He wrote the seven books, one per year, from 1950 to 1956, starting with Lion, Witch, and the Wardrobe and ending with The Last Battle. But in the middle are several stories displaced in time, a prequel, a side quest, until the Narnian chronology becomes mixed up. So, do you read his books in the order in which he wrote them or do you read them in the order in which they take place in this magical world? I think the answer is quite simple; it doesn’t matter. As I read these marvelous books to my children, I will read them in the order Lewis created them, but if I ever read them aloud again I’d probably go for chronological order. These are great stories no matter in what manner they are enjoyed, books that demand a reread right after you finish, classics that will be a part of your shelves forever. I consider the first three that Lewis wrote to be Part 1 of the entire set: Lion, Witch, and the Wardrobe, Prince Caspian, and Dawn Treader. These three all include the Pevensie children, their growth in our world and their adventures in Narnia. In LW&W, the four siblings (Peter, Susan, Edmond, Lucy) reach a fantastic land through a forgotten wardrobe, allying themselves with the great Lion Aslan against the evil White Witch. In Prince Caspian, the children return to Narnia, where many years have passed, to aid a young prince in his fight against his tyrannical uncle Miraz. And in Dawn Treader, Edmund & Lucy, along with their cousin, accompany Caspian on a voyage over the sea to discover uncharted islands and find a lost crew of lords. 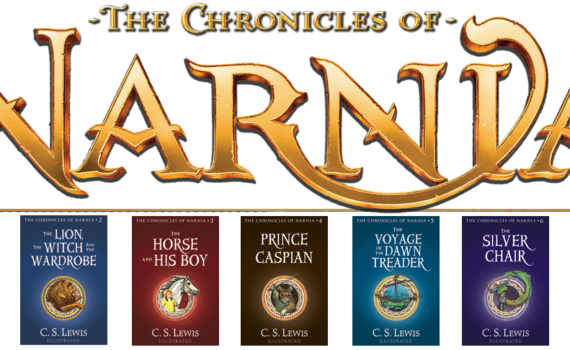 This trio of books denotes two eras of Narnia and the exciting events of the lives of the amazing Pevensies. I can recall reading these stories when I was young, over & over again until I knew them by heart. They are quick & easy, fun to blast through, and always entertaining to both children & adults. But they are also laden with meaning, both Christian and pagan, based on ancient lore, and full of the myths are world is based upon. Read from a Christian perspective, since Lewis was that, obvious parallels emerge, but the stories can be enjoyed by those who are non-religious as well. It’s a beautiful world that he created, with colorful characters and adventures that will never grow old. These three books are the strongest, I believe, setting the stage for the rest but never being outdone by those to come. Read these classics to yourself or to your children, and then go back years later to revisit old friends; this series is special in that way, allowing us to travel to Narnia whenever we want and as often as we can.